Canadian Wildlife Federation: What's Putting Bats At Risk? What's Putting Bats At Risk? Bats are amazing animals that are vital to the health of our environment and economy. Although we may not always see them, bats are hard at work all around the world each night – eating thousands of insects, pollinating flowers, and spreading seeds that grow new plants and trees. Step outside around dusk and take a few moments to look for bats in your neighbourhood! 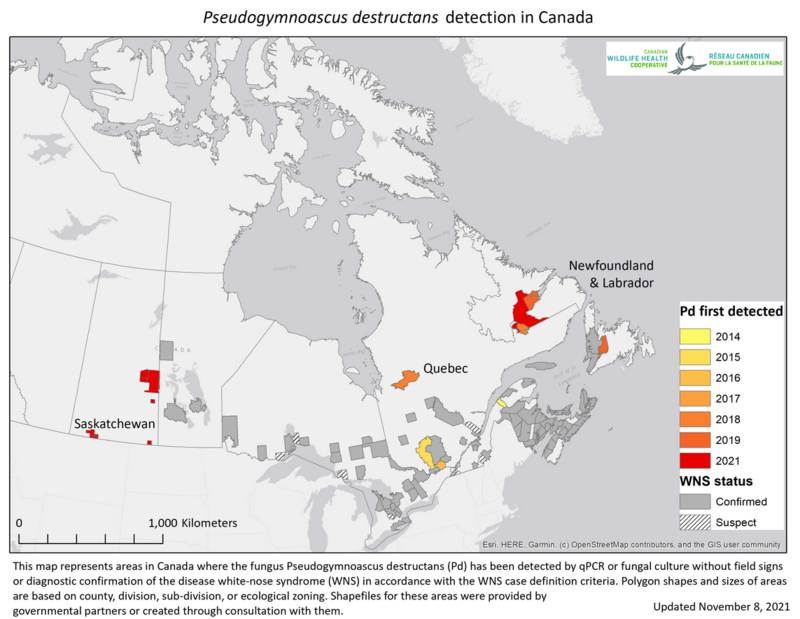 White-nose syndrome (WNS) is a disease caused by the fungus Pseudogymnoascus destructans. This fungus grows on the exposed skin of bats as they hibernate during the winter in caves and mines. The cool temperatures of these hibernating sites allows the fungus to grow and spread throughout the site and on the bats themselves. The disease shows up as a fuzzy white substance on their ears, wings and muzzles. However, this isn’t the only damage this fungus causes. Internally, the bat’s muscle tissues and blood vessels are affected. Sadly, bats end up dying as a result of two things: dehydration — since they lose water and electrolytes from their wings, and also starvation — as they wake up from hibernation more frequently and end up using their fat reserves which can’t be replaced as flying insects are not available during the dead of winter. White-nose syndrome is a fairly new disease. Although it’s now considered native to Europe, it was only first observed in 2006 in New York State and not until 2010 in Canada. Much research is being done on the disease, including establishing baseline data on bat populations, learning about native cave fungi, looking for techniques to stop or control the spread of white-nose syndrome, and establishing research priorities and best management practices. It’s quite amazing what has been learned so far! 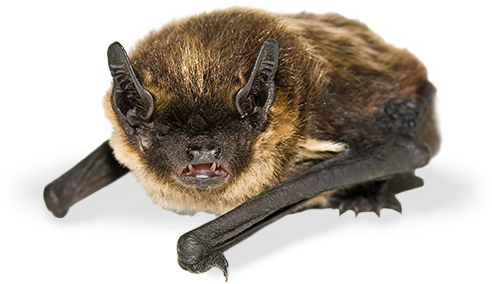 Little Brown Myotis often decline by 90 to 100 per cent in hibernacula with white-nose syndrome, while Big Brown Bat declines are more often in the 30 to 60 per cent range. Bat species in Western Europe that are exposed to the fungus do not appear to decline at all! The reason(s) for the differences are not known - it is related to the fact that the fungus and bats have co-evolved over a long period of time, but studies are ongoing. Understanding why some bat species are resistant to white-nose syndrome may offer insight for a future cure. Many bats depend on riparian areas (riverbanks, lakeshores, etc.) for both water and insect foraging. The degradation of our waterways through pollution or the destruction of natural vegetation along stream, pond, and lake edges seriously affects many species of bats. Deforestation affects bat species that rely on forests for roosting and foraging. In particular, the loss of old-growth forests threatens certain bats. Many of these species roost in older trees or snags (dead or dying trees). Forestry practices that create even-aged stands, such as clear-cutting, result in the loss of these very important roost sites. During the summer, bats like to roost in large trees, but human activities over the past 100 years have made large trees scarce. Bats have adapted to this situation by roosting in barns and people’s attics. 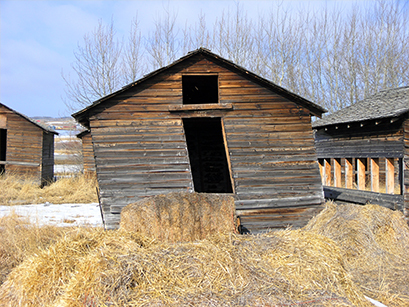 However, modern building methods often exclude bats and barns are being torn down, reducing suitable roosts for bats. Bats require roosts that have the right microclimate and are safe from predators and other disturbances. Pesticides affect bats directly and indirectly. Crops are often sprayed in early evening, when bats are active. Direct spraying can quickly lead to the death of bats. Pesticides also affect bats indirectly by killing off a wide assortment of insects, which limits their food sources. Contrary to popular belief, bats are not blind. 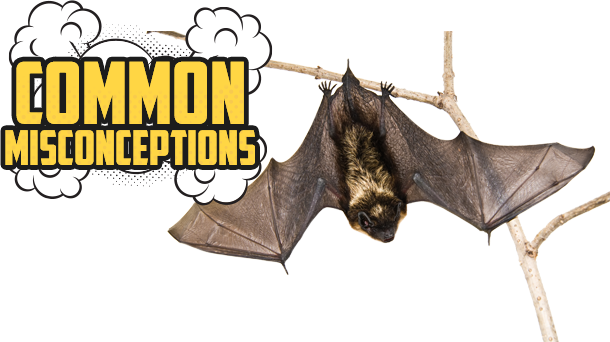 In fact, bats can “see” better than we can in the dark because they are equipped with a highly developed sense called echolocation. When using echolocation, bats produce a series of extremely high frequency chirps. These chirps are emitted in the form of sound waves that bounce off of objects and prey. When bounced off an object, these sound waves return to the bat in the form of an echo, thus helping the bat to navigate and hunt. These chirps are so high in frequency that they are inaudible to the human ear. The chirps that you hear from the bats as they emerge from their roosts are social calls, not echolocation. Bats don’t get caught in your hair, but they may swoop around your head if there are bugs flying around. Think of it as being a natural form of bug repellant. All mammals can contract and transfer rabies – not just bats. Cases involving bats and rabies in Canada is rare. In general, people should avoid handling any wildlife. Bats have long been feared as carriers of rabies. In reality, less than one percent of bats contract rabies, no higher than the rate in many other mammals. Once infected with rabies, bats quickly become paralyzed and die, seldom becoming aggressive. Bats, however, should never be handled. Like all wild animals, they are likely to bite in self-defence. Handling is especially unwise if the bat appears to be sick. If a bat bites you, immediately wash the wound with soap and water and seek medical advice.